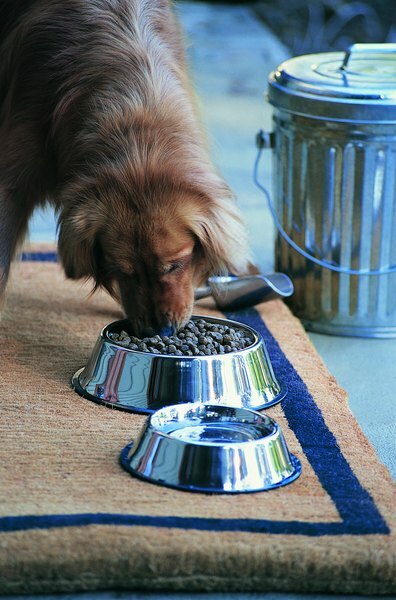 The FDA makes sure your pooch's food is safe. The Food and Drug Administration regulates dog food, and in many respects as stringently as people food. You've probably seen "AAFCO" mentioned on pet food labels. This organization, the Association of American Feed Control Officials has no official powers, but it sets nutritional and labeling standard recommendations. The US Food and Drug Administration, or FDA, is the government organization charged with the hefty task of monitoring all the edibles and pharmaceuticals people enjoy; it also sets and enforces regulations for dog food. It ensures everything you buy to feed your four-legged friend is safe for consumption, manufactured in sanitary conditions, free of anything considered dangerous and labeled accurately. It also defines some of the terminology that often appears on dog food labels. However, the FDA doesn't approve pooch food before it hits the shelves. The FDA insists labels on all dog food identify the product and its ingredients in descending order by weight, as well as the manufacturer's name and address. The label also has to define the quantity of food and the guaranteed analysis of crude protein, fat, fiber and moisture. It should also indicate what life stage the food is nutritionally balanced for and provide general feeding instructions. The FDA watches your back when it comes to dog food claims about helping with health conditions, providing low levels of certain nutrients or being specially formulated to do one thing or another. These sorts of claims must be clinically demonstrated to fit FDA standards, and the organization creates definitions for somewhat subjective terms like "low" and even seemingly objective terms like "100%." The Association of American Feed Control Officials, or AAFCO, sets nutrient profiles for dog food. These represent the minimum recommended quantities of all essential nutrients a serving of dog food needs to provide for a pooch in a particular life stage. This organization doesn't regulate, test, approve or certify any pet food, though; it's up to manufacturers and the FDA to ensure a food satisfies a claim. If a dog food meets the complete nutrient profile for a certain life stage, the label must use the phrase "[Name of product] is formulated to meet the nutritional levels established by the AAFCO Dog Food Nutrient Profiles for [life stage]."